Why do we tell so many stories about the world wars? There are so many stories in popular culture about the World Wars. Think about it. The Book Thief, All the Light We Cannot See, Hannah Coulter, Number the Stars, Rilla of Ingleside, The Lion, the Witch, and the Wardrobe, The Guernsey Literary and Potato Peel Pie Society, the Boy in Striped Pajamas, Number the Stars, and dozens more could be named! Captain America, Thin Red Line, Saving Private Ryan, Dunkirk, Hacksaw Ridge, Atonement, Schindler’s List, Valkyrie, Inglorious Basterds…The list goes on and on. There are many ways we could answer this question, but one in particular stands out to me. Stories about the World Wars tend to pose this question: Can people good in impossible times? Can goodness survive the gravest of evils? These wars were both turning points in history and huge stumbling blocks to both the care free progressivism of their day and the trite theological defence of the problem of pain. The evil and darkness faced in both world wars shook the world of philosophy and theology, causing us to reckon with theodicy (the defence of God’s goodness in the face of evil) and nihilism (the idea that life has no purpose or moral impetus) in an unprecedented way. These are questions which still concerns us. But the unprecendented evil also gave way to unprecedented bravery. The World Wars seemed to throw these two together; great evil, and great goodness. What are we to make of it? The issues are different in our day, but we still face this question: can we be good in the face of evil? Can goodness survive in the face of evil? This is the question we will explore in today’s podcast. Laurence Binyon (1869-1943), Poet, Dramatist, and Scholar. We tell the stories of the World Wars to make sense of the trauma the World Wars Inflicted. Living in the UK, I’ve realized that WWII and even WWI are more much vivid in the cultural memory than they are the in the States. This of course makes sense because the war actually occurred on their land, civilians died, and their military losses far outweighed our own. In the first World War, nearly one million men died. That’s about in every 45 people in the United Kingdom at that point. And when you consider the fact that most of the people who died were young men, and that they made up a fairly small portion of the overall population, you realise that the first World War wiped out nearly a whole generation of young men. And even the men who did come home were often wounded, or riddled with Shell Shock (what we would call Post Traumatic Stress Disorder). Writers like Tolkien and Lewis were forever marked by their experiences in the war, both psychologically and in their day to day lives. Lewis, for his whole life, took care of the family of his best friend in war as they promised. 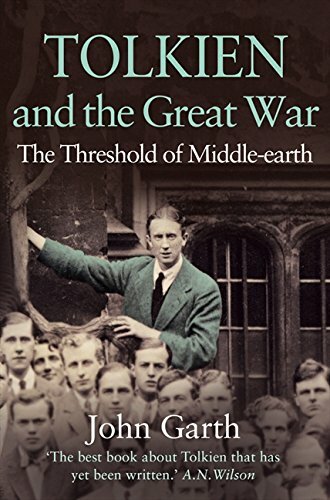 Tolkien lost two of his best friends in the War, and saw his writing as a necessary duty in carrying on their legacy (you can learn more about that in Tolkien and the Great War. This presented a problem to contemporary artists: how did they memorialise this terrible war? I think we tell stories about the World wars to make sense of this great evil, this great trauma. And this from a man whose stories are filled with war. What Tolkien understood, though, is that we should not, by trying to elevate the heroes of war, elevate war in itself. War and evil will always be a part of our experience in a fallen and broken world. What we need to is not glorify war, but instead learn how to be brave, and how to be humane within it. To defy Harvey Dent. To prepare ourselves to be decent people, even in indecent times. We tell stories about the World Wars to help us believe that even in impossible times, good people will resist evil together. Dunkirk is the story of the largest military evacuation in history. This movie is about bravery in the face of almost certain defeat. The reason we love it, I think, is because it represents everything good about British culture, everything we long to celebrate and emulate. Miraculously, they were not defeated, and it was because of the actions of 700 ordinary, brave men. That’s what we want to believe England is, or at least what it can be. On the eve of the operation (May 26, 1940) a national day of prayer was declared with King George VI attending a special service in Westminster Abbey. a large number of those soldiers were evacuated by 700 “small boats” ranging from fishermen’s boats, to small yachts. If you want to read more about it, check out The Miracle of Dunkirk by Walter Lord. The Miracle of Dunkirk reminds us that even in impossible times, good people will always band together to stand against evil. Are we ready to be those people? We tell the stories of the World Wars to remind ourselves that even if your whole world is evil, we must be brave and good. Schindler’s List is based on a true story of a German national who through cunning and bribery managed to save 1,200 Jews from extermination camps. This movie is one of the most significant movies in film history. It was nominated for 12 Oscars and won 5. The music, which I will attach here, is one of the most iconic and recognisable film scores to ever be produced. What is differentiates Schindler’s List from Dunkirk is this: Dunkirk is about many people standing against a great evil together, Schindler is about one man who is a part of the evil army, with every reason to join them, yet eventually turns against evil. It is profound because lurking in the back of our minds is the fear that if everyone else were evil, we might forget what goodness was. We might capitulate. This story reminds us that even when nothing around us is good, we must, and we can fight for truth and goodness. I will be honest: I have not seen Schindler’s list, and I don’t think I ever can. But I find Schindler’s story compelling because it is one which bucks against the pessimism I can sometimes find in my own heart. Always choose goodness— it does make a difference. With each brave action, we reflect what Tolkien would call the “final victory.” Goodness is never in vain. Perhaps we will not face war like they did. Perhaps we will. What we do know is this: we live in a world that is broken as it was broken then. We will encounter evil in its various guises. We will encounter darkness and injustice. What these stories can teach us is to prepare to be decent people even in indencent times. To row your boat to save the soldiers. To use every resource you have to rescue innocent people. To resist what you know is evil. Do not quiet the voice in your heart that tells you what is wrong. Listen to it. Prepare yourself to be brave. Always. They remind us that we have the capacity to be brave, to bond with our friends in sacrificial love and bravery, and sometimes, even on our own, to resist evil to our last breath. They make us want to be a part of the resistance against evil. But to do that we must hold onto the belief that darkness will not be final, that our battle is not in vain. It makes me think of Samwise, sitting in Mordor, thinking that the likelihood is that this is where he will perish, and pursuing the course nonetheless.